Barbra Streisand waded into one of Israel's touchiest issues during the first major stop on her tour of the country -- Jewish religious practices that separate men and women. Speaking at the Hebrew University of Jerusalem on Monday, she took aim at cases of ultra-Orthodox Jews targeting women. "It's distressing to read about women in Israel being forced to sit in the back of the bus," she said, "or when we hear about `Women of the Wall' having metal chairs thrown at them when they attempt to peacefully and legally pray." She was referring to isolated incidents in which ultra-Orthodox men tried to force women to sit separately at the rear of buses that go through their neighborhoods, as well as more serious clashes in which ultra-Orthodox Jews tried to prevent women donning prayer shawls and carrying Torah scrolls from praying at the Western Wall in Jerusalem, the holiest site where Jews can worship. According to traditional Orthodox Jewish practice, only men wear prayer shawls and handle Torah scrolls, though that is slowly changing in some places. Ultra-Orthodox Jews, who cut themselves off from the rest of society but wield disproportionate power in government and religious affairs, fear that allowing women to make such inroads will erode their authority. Israeli Justice Minister Tzipi Livni has introduced legislation making forced separation of men and women in public places like buses illegal. On the issue of women praying at the Western Wall, a court has upheld the right of women to wear prayer shawls, and a proposal has also been made to set aside a section of the Western Wall for mixed-gender prayers. Streisand was born into a Jewish family and is often viewed as an icon of Jewish American entertainment. This current trip marks her first time to Israel since 1984. On Monday, she was awarded an honorary Ph.D from the Hebrew University. 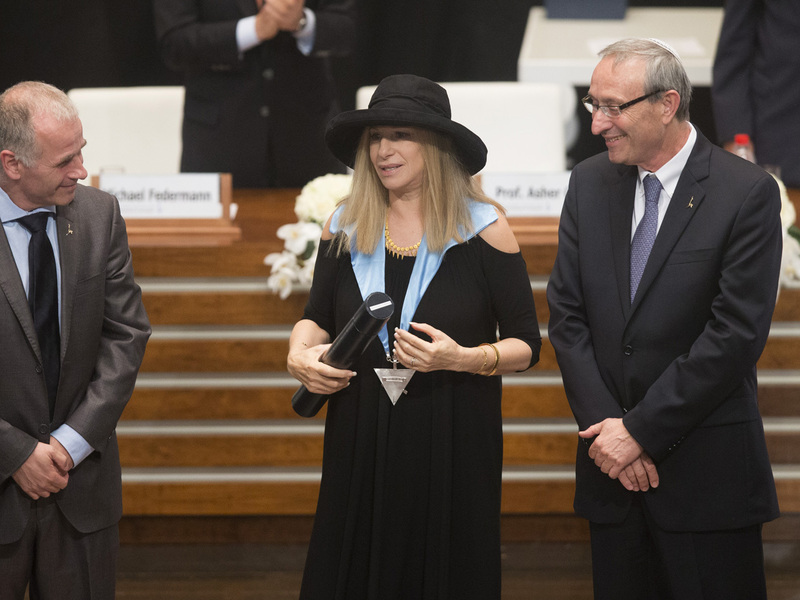 In her acceptance speech, Streisand spoke at length of her admiration for Israel and the university, which opened a building named after her father in 1984 after she donated money for its construction. She stressed the need for gender equality, praising the university for graduating a record number of female Ph.D. students this year, the first time that women made up a majority of the degree recipients. University officials called the Jewish singer and actor "a close friend of Israel" and said that her honorary Ph.D. was "an opportunity to recognize her support, her friendship, her generosity." Streisand's tour has attracted widespread attention from the public and the media. Her arrival at Israel's Ben-Gurion Airport on Sunday, with her dog in tow, received prominent media coverage. Streisand, 71, will attend the 90th birthday party of Israeli President Shimon Peres later in the week before appearing at her first-ever series of concerts in Israel on Thursday and Saturday.